Askaway, our chat reference service, opens today! Need help with a research question, struggling with formatting a citation, or have questions about borrowing library materials - log on to the Askaway virtual reference service and let our research experts help you? Are you looking for recent Canadian public policy documents or health-related research? Our new Canadian Public Policy Collection and Canadian Health Research Collection provide us with approximately 38,000 full text Canadian publications from federal, provincial and territorial government agencies, as well as research institutions such as the Aboriginal Healing Foundation, Federation of Canadian Municipalities, Vanier Institute of the Family, Canadian Centre for Policy Alternatives and more. Provided by the Canadian Electronic Library and hosted on the familiar ebrary platform, the documents may be printed, linked to using persistent links and incorporated into course packs. All titles are included in the library catalogue, or you may search the collections using these Research Database links. For more information, contact Patti Wilson. Did you know UFV Library has a great collection of Fiction? The Abbotsford Campus Library’s summer display is all about reading, so why not try out some of our great fiction reads! Do you need some ideas for what to read? 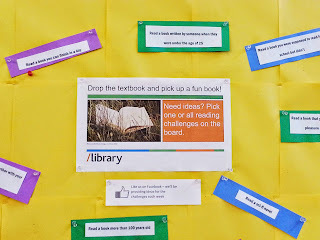 Choose a reading challenge from the bulletin board and see where it takes you. 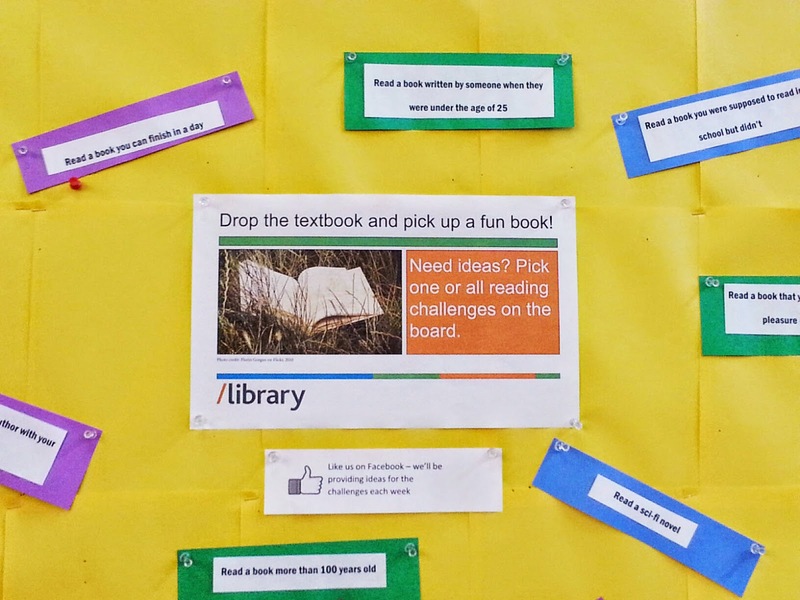 You can add a push pin to the bulletin board to show what reading challenges you have completed. You can also like us on Facebook for book ideas for the different challenges. UFV's Dr Molly Ungar and student Pierce Smith win Chilliwack Museum and Archives Society Heritage Award. The Poppy Project is an interactive exhibit using Google Maps showing the home addresses of people from Chilliwack listed on the Chilliwack War Memorial who died in World War I & II. The exhibit is a collaboration between the University of the Fraser Valley's History department and the Chilliwack Museum and Archives. UFV student Pierce Smith undertook research to determine where soliders, listed on the War Memorial, lived in Chilliwack. To view the online exhibit, click here. For more information about the Heritage Awards, click here.